Greys and Brat Kings played excellent sets Thursday night at House of TARG, and then we all rang in Friday with midnight hotdogs. Only at Rock n’ Roll Hot Dog Party. Ottawa Explosion did it again, gathering two great bands and topping it off with free late night snacks in the form of hot dogs and veggy dogs. Kicking off the night were Brat Kings from Toronto/Montreal. The three-piece were a perfect balance of punk rock snarl and pop punk “woooos,” and sing alongs. With tougher sounding songs with titles like “Girl, Quit the Cocaine” and songs about rat tails, counterbalanced with softer love songs such as “Quick Coasting,” some may call it an identity crisis. But I call it the unity of my two favourite elements of punk rock all in one band. The other aspect that stood out was their amazingly animated drummer Theo Mckibbon, who looked genuinely pissed off at his kit the whole time. The man looked possessed while wailing on the drum set, and this was particularly true during the band’s final track which also featured a booming drum intro. 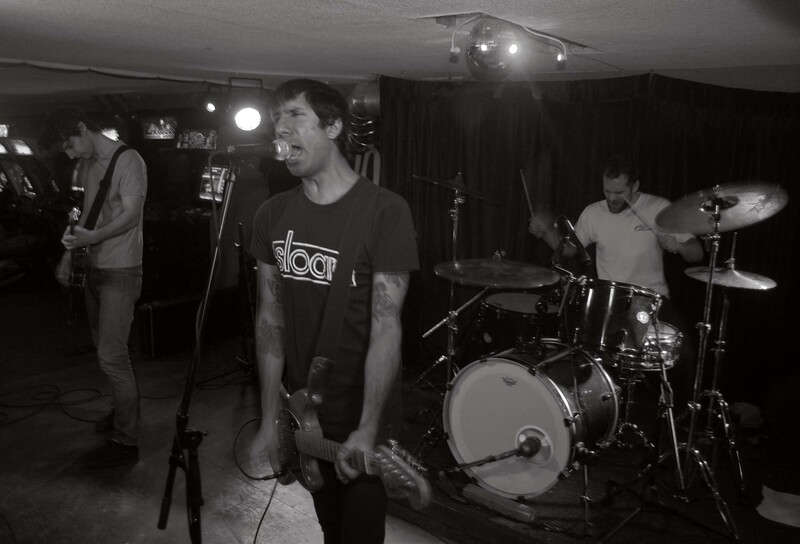 Keep an eye out for a new 7″ from Brat Kings coming out soon on Hosehead Records featuring one of my favourite tracks from their set “Good Drugs.” They will also be working on a full-length shortly which will certain rock. Greys were up next and they displayed a lot of bravery considering they were the only thing standing between the crowd and mounds of hotdogs. The Toronto-based four-piece rocked us playing a bunch of killer fast-paced tracks off their amazing debut album. 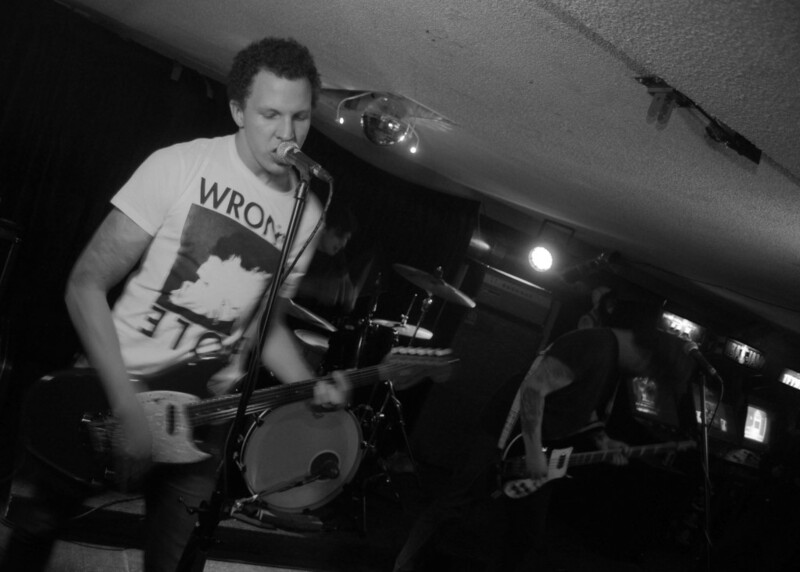 Greys channel early and mid ’90s noise rock and blend it with aspects of punk rock. Songs like “Flip Yr Lid” could of come right out of Seattle 20 years ago with its distorted sound and unabashed vocals. Then the band answered back with tracks like “Aderall” and their closer “Use Your Delusion” where one really sees their punk rock side coming through. Lead singer and guitarist, Shehzaad Jiwani, just loved that water at House of TARG. “Seriously though, I know I have said it before, but the water is really good,” he said. “It’s got lemon in it and I’m not sure if that is it, but it’s free right over there.” The band also took the time to dedicate the song “Guy Picciotto” to “a guy name Shawn Scallen” – as if we didn’t all know who he was. Do not sleep on these guys next time they roll through town. They are a powerful band with a lot of energy, and great guys too. With Greys done it was time for the mountains of hotdogs to be unleashed upon the crowd. Everyone lined up in a surprisingly orderly fashion and chowed down as the early morning hours of Friday dawned upon us. I really like the new twist on an old Ottawa classic that was the Rock n’ Roll Pizza Party from back in the day. Well done, gents. Hot dogs on hot dogs on hot dogs. 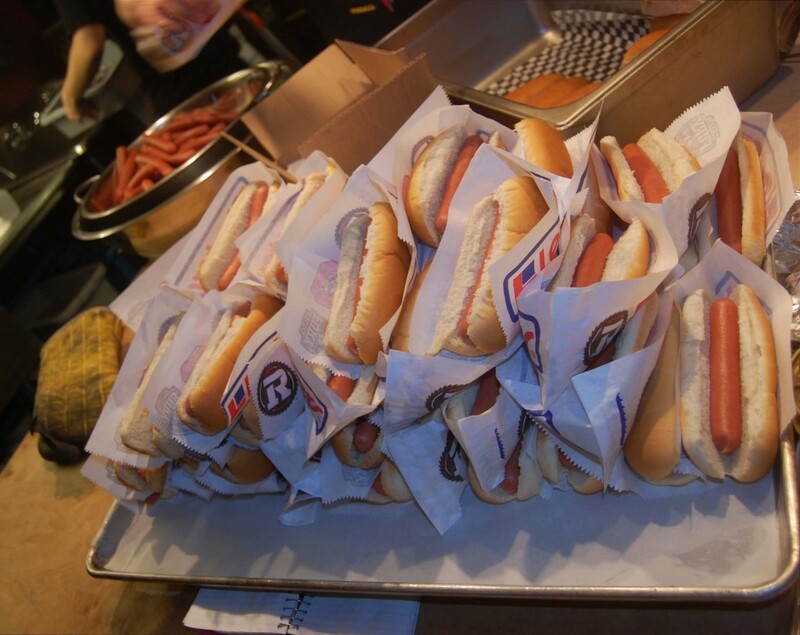 Hot dogs are piled high at House of TARG in Ottawa, ON for the Rock n’ Roll Party. These bad boys are were handed out for free at midnight.